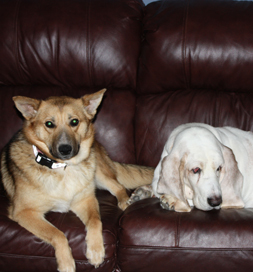 Bocephus (Bo) the Basset Hound was in mourning for his friend, Ellie, a Basset/Beagle mix, who had died of lung cancer. As time passed, the mourning got worse. Vicki Allen, who lives in Central City, KY, thought maybe adopting another dog would help Bo, but it was just a guess, and she wasn’t sure she was ready. Harmony among pets is sometimes hard to achieve, and she had four senior cats to consider. Nevertheless, she began to look on Petfinder. She spotted a German Shepherd named Sheena, listed by Rowdy Rescue in Slaughters, KY, who appealed to her, but she was reluctant to make a commitment. So she went about her daily life and her work at the Green River Correctional Complex in Central City, wondering what to do about Bo’s grief. Sheena kept popping up in her thoughts. She arranged a home visit to see how the pet family would react. Everything seemed to be going fine, and it was a joy to see Bo play again. He seemed happy. Then one of the cats hissed at Sheena, and Vicki held her breath and prepared to intervene, but Sheena simply fell to the floor submissively. “I immediately knew she wasn’t going to hurt the cats,” Vicki says. Too soon, it was time to take Sheena back to the prison. Vicki started adoption proceedings, but watched as Bo fell back into mourning, more deeply than before. When she explained the situation to the people with Rowdy Rescue and Death Row Dogs, they suggested early adoption. The two dogs have become almost inseparable. “Wherever he goes, she goes,” Vicki says. Happiness once again reigns in the Allen household. Both Bo and the late Ellie were graduates of Death Row Dogs. The intensive training program pairs dogs that seem unadoptable with inmates at the prison. The dogs are trained to make them more adoptable, and the trainers learn skills and compassion that will help them make the transition to life outside the facility upon their release. Since 2004, over 500 dogs have participated. What an outstanding program!